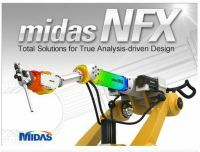 midas NFX in Practice Series is a new MIDAS training program that aims to help NFX users gain technical insights in applying Finite Element Method in structural design and analysis project. Every month the webinar will be arranged by MIDAS experts which will share useful tips and practical applications on the use of midas NFX package. For more information please contact us by midasNFX@femcomp.se. The latest version of Femap v12 supports the new NX™ Nastran® Multistep Nonlinear solver which enables you to analyze models with nonlinearity from contacting parts, material property nonlinearities and/or geometric nonlinearities (like large deformations and large strains). This solution is an add-on module of NX Nastran – Basic Nonlinear package. 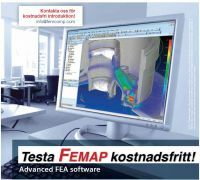 Femap™ software version 12 is the latest release of the standalone finite element modeling pre- and post-processor for engineering simulation and analysis. Femap v.12 provides a number of user interface improvements and enhancements to pre-/post-processing functionality with extended solver support. Knowledge of advanced engineering analysis can give you a huge advantage as you enter the professional workforce. You can build the skills you need with Femap Student Edition software - a most advanced engineering analysis environment on the market. Under hela 2019 erbjuder vi en kostnadsfri utbildning för alla som vill testa FEMAP. Utvärdering av FEMAP paketet är fri och varar upp till 45 dagar när det passar dig. We have reinforced our capacity and simulation resources to offer FEA Design and Computation Services. Our offer includes general design and strength analyses as well as specific Design and FEA Simulations within Marine, Offshore and Power Plants Industries.